Extensive collection of 19th century leather bound books, priced per book, various colors, sizes, most with embossed gilt decoration. This is just a partial offering of what we have, always check in with us as our inventory is constantly changing. All in English although we do have others not in English that are less expensive, good for use as fillers. Note: These pictures were taken preconditioning, we condition and polish all our leather bindings. New Shipment Of Assorted Leather Bound Books, Priced Per Book. Three Sterling silver full mast ship in glass and ebonized and mahogany wood case, great details and craftsmanship. Priced per ship. An 19th century English cased drawing set length of longest tool. Measures: 6 1/4 inches. 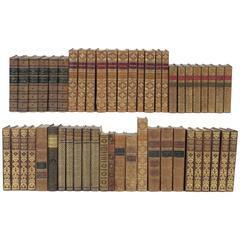 Decorative collection of 124 Swedish vintage leather-bound books Measures between 6.9 inches and 10.6 inches. Magnificent pair of miniature 19th century globes on mahogany Regency Stand. Both globes are labeled by Newton and Sons. The Globes are mounted on Classic Regency pedestals. Great collection of ten leather books, France, 18th century. Weathered. Measured as a group. Set of four large thick, 18th century leather-bound books for decoration Latin text, catalogues "Catalogi Bibliothecæ Regiæ".